As I have called my blog Fire and Focaccia, it is probably a good idea for me to have a fairly decent focaccia recipe. I don't often use commercial yeast except for things like sweet buns, tea cakes, hot cross buns, pain au raisin, etc. So my starting point for this focaccia recipe is my sourdough starter. I refreshed my sourdough starter Thursday evening and the next morning, yesterday, I made a poolish style pre-ferment (I will blog more about sourdough starters and pre-ferments another day), approximately 100% hydration and for a large proportion of my finish dough volume. My pre-ferment in this attempt accounted for approximately 50% of the flour weight of my final dough. 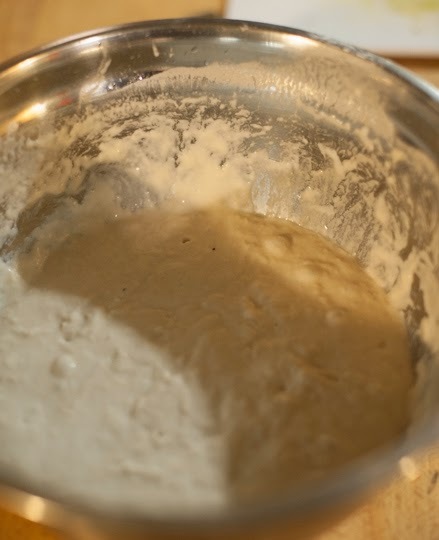 The pre-ferment consisted 600 g of flour and about 600 ml of water. Yesterday evening I made the dough. 600g of flour and 150 ml of olive oil mixed together, the pre-ferment and another 300 ml of cold water, mixed together and then rested for 15 mins before kneading. I was a little concerned that with only a natural sourdough leaven, this quantity of oil would retard the yeast enough to make this a complete failure. Half way through kneading I added 30 g of salt and then increased the hydration of the dough by continually wetting my hands for the remaining 10 mins. 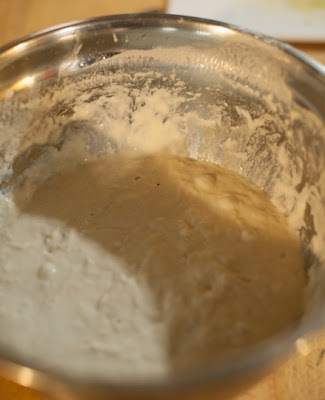 This way I worked in another 150 ml of water so that the dough became wet enough. I wanted to make this dough wet enough so the finished product would look like focaccia at least. After fermentation all night in a cool room, maybe 14 °C I fermented for another hour at room temperature before halving, rolling in olive oil and while gently de-gassing by folding the outsides into the center a few times, I folded in some dried herbs. 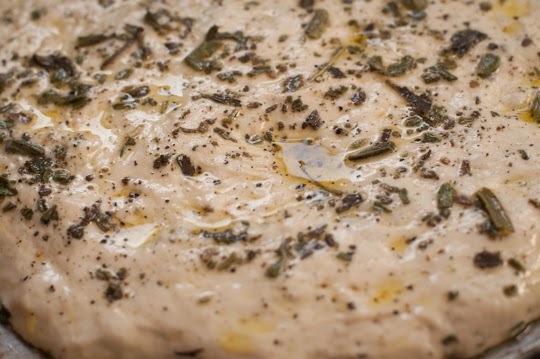 The dough was then gently stretch onto two separate baking trays, dimpled, more olive oil and herbs a bit of black pepper and another hour at room temperature before pre-heating the oven. One of the two trays then went in refrigerator to retard overnight to see if that makes any improvement, the other tray was baked for lunch. I'm fairly happy with the end result, I will make a few changes to the way I bake the second batch tomorrow. 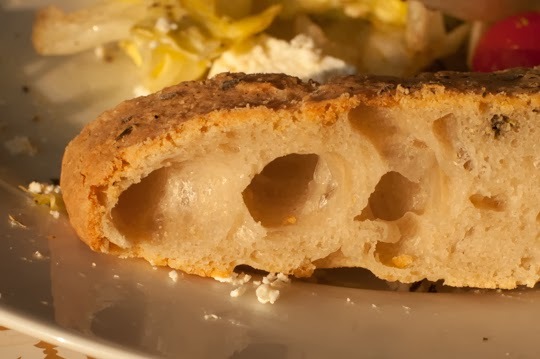 The flavor was there, the crumb was super soft and light, but the crust can defiantly be improved a lot. A few more goes and I will be ready to call this a recipe!